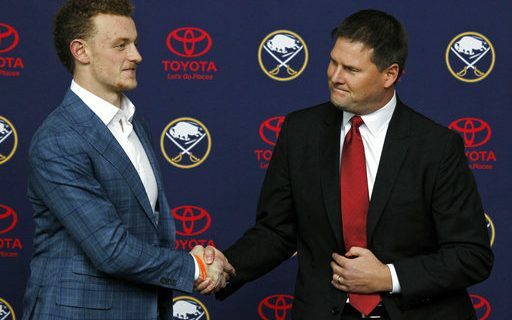 This is a big week for Buffalo Sabres General Manager Jason Botterill. He gets to draft Rasmus Dahlin first overall on Friday. He’ll also get the chance to fix the Sabres problems by considering some trades. But as sports humorist Jeff Wozer has discovered, there are other perks to the job of being Buffalo’s #1 hockey man. • After home games gets first dibs on lost and found items. • Can watch Canalside concerts naked through Keybank Center air shafts. • Three words: free growler refills. • Bills fans never tire watching him jump from a bus onto a flaming table. • Can claim he’s scouting a prospect in Hawaii for two weeks with no questions asked. • Doesn’t have to attend games on nights that conflict with CBS’s Madam Secretary. • Gets to use the Pegulas’ yacht in exchange for giving Terry advice in his Fantasy Hockey draft. • Gets to maintain Sabres Green Team membership even though office thermostat is set at 79 degrees. • During Sabres annual golf tournament allowed to hit from the ladies tees. • GM box is perfectly angled allowing him, during home games, to toss pizza logs at Brian Duff without him knowing it. Jeff always has a funny take on Buffalo sports. Check out his signs a Bills rookie has hired a bad agent and signs your kid has a bad Little League coach.